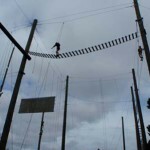 The Challenge High Ropes Course (CHRC) is an invigorating and breath-taking challenge that will push you to your mental, physical and emotional limits. 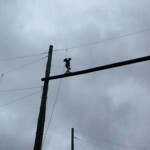 The High Ropes Course is suited for groups of all ages and develops the participants communication skills, team focus, leadership ability and sense of personal desire for a challenge. The course has the ability to challenge all participants irrelevant of fitness, strength and endurance. This course is an excellent corporate team building activity which develops confidence, communication skills and teamwork and will allow the team to gain a greater insight into each others strengths and weaknesses whilst building a solid team culture. 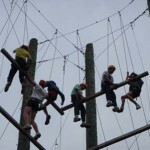 The High Ropes course is an excellent activity for community groups, alternative education programs and corporate groups alike. You will need to allocate 4 hours to complete the course. The Joshua Foundation staff are able to facilitae groups from 8 through to 50 people at a time.